Justice Okon Abang of the Federal High Court, Abuja, on Friday ordered the spokesperson of the Peoples Democratic Party, Olisa Metuh, remanded in Kuje Prison in the Federal Capital Territory, while his trial for alleged money laundering offences continues. Mr. Metuh pleaded not guilty to the seven-count charge of fraud levelled against him by the Economic and Financial Crimes Commission, EFCC. The EFCC is accusing him of receiving N400 million from the former National Security Adviser, Sambo Dasuki, believed to be part of a $2.1 billion meant for arms procurement but which was allegedly diverted by Mr. Dasuki. 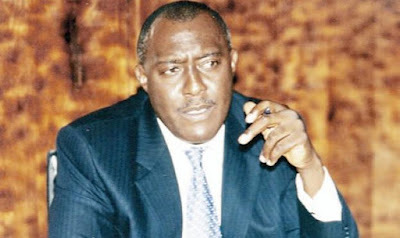 After pleading not guilty to the charges, the counsel to the EFCC, Sylvanus Tahir, moved that the court decides a date for the continuation of the hearing, but requested that Mr. Metuh be remanded in prison while trial in the case continues. But Mr. Metuh’s counsel, Onyeachi Ikpeazu, asked the court to discountenance the request for his client’s further detention, describing it as illegal and unconstitutional. He said the EFCC had a legal obligation to provide them (the respondents) with a seven-day notice before the arraignment of Mr. Metuh in court. He therefore prayed the court to grant his client bail on liberal terms. Responding, Mr. Tahir said the application for bail was oral and should therefore be refused. He noted that the court was one of record keeping, stressing that an order be given for the application to reflect the status of the court. Mr. Tahir asked the court to demand a written application so that the defendant’s grounds for the application would be put on record, as well as the prosecution’s ground for opposing the application. He also added that Section 158 of the Administration of Criminal Justice Act mentioned by Mr. Ikpeazu dealt mainly with written application, a claim vehemently objected to by Mr. Ikpeazu. After hearing the arguments of both parties, Mr. Abang noted that the matter for determination by the court was whether or not the oral application for bail should be granted. He ruled that it was not out of place for the court to grant oral application for bail, stressing that section 158 and 162 of the constitution argued by both parties did not state whether an application for bail must be written or oral. He however added that the court was not in a position to decide the prosecution’s ground for opposing the application for bail on Friday. Mr. Abang added that where the prosecution is objecting to bail, it should be allowed to place on record the grounds on which it is objecting. He also noted that the defence counsel should also be allowed to place its facts before the court to back its application for bail, arguing that both parties cannot place such facts “before the bar”. He also gave the defence counsel six hours from the time of ruling to file its application for bail before the court, while the persecution had 24 hours after receiving the same application to file its brief of argument against it. Mr. Abang further said the defence counsel was expected to submit its response within five hours of receiving prosecution’s brief of argument. The matter was adjourned till January 19 for consideration of Mr. Metuh’s bail application.